Spacious one bedroom apartment comprises entire first floor of the building. This home is fully equipped for two people to enjoy. 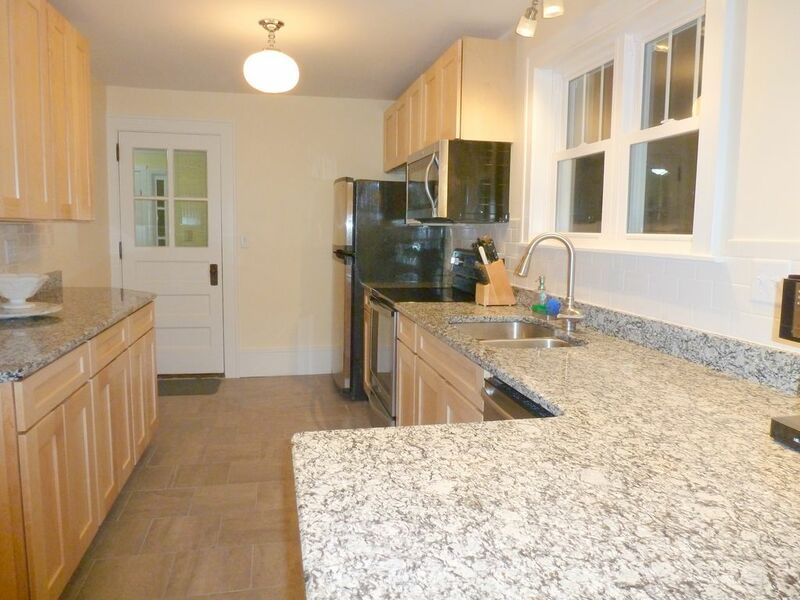 The upgraded open kitchen is very well laid out to make for easy meal preparation, complete with dining room. Living room features a roomy sofa, love seat and cozy chair for relaxing or watching the large flat screen television. The bedroom is furnished with a king size bed with new mattress, many closets and a writing desk. The custom tiled bath has a sink, toilet, shower and linen closet. There is a front porch with natural gas barbecue for outdoor enjoyment. The sun room office at the back of the house is a great place for morning coffee and sun. Cable and wireless internet are provided. The home is fully stocked with linens for bed and bath as well as all kitchen necessities. Our sister property is located next door and can accommodate up to six guests. Property #336139. The location is excellent, just a short walk to Church street marketplace. UVM campus green is two blocks east of the home and Champlain campus is two blocks south of the home. Parking for one vehicle in the driveway. Laundry onsite. Custom full bathroom with pedestal sink, stand up shower and linen closet. The home is just three blocks from Church Street Marketplace. The full size sofa features a queen size hide a bed. Our stay here was perfect! The location is great for walking downtown. The apartment was clean, comfortable and uncluttered. We especially enjoyed the front porch. We will most definitely stay here again!